Camp Stitchalot was a resounding success. The weather here on the East Coast another Nor'easter made for a tense Wednesday as they kept pushing back the snow stop time and I was leaving early Thursday morning. Fortunately the snow stopped, the roads were clear and Federal government offices in DC opened two hours late, so I didn't have to deal with horrible traffic on the way north. An overnight at my sister's and I was off to Davison, Michigan. I made a stop at Stitches 'n Things it was sort of on the way after all to do some pre-retreat shopping, but didn't spend too much as there was going to be a boutique at the hotel and I could always go back to the shop if I really needed something. I got checked-in, settled in and did a quick run around the boutique before heading off across the parking lot to Lucky's Steakhouse for dinner with my sister-in-law. The retreat officially started at 7:30 with a welcome and a very nice gift bag (including a very nice bag). I've already put all the things away so no pictures but it included two limited edition GAST threads, a fabric frame, some yummy candy and some charts. 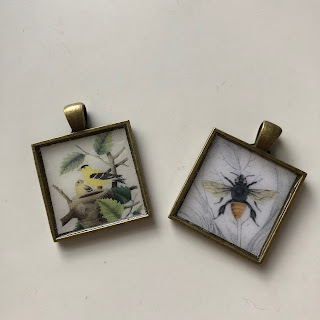 Friday evening we picked and cut out the pictures and glued them into the pendent. Saturday we sealed them and Sunday we put a resin coat on them. They're about 1" square and I think I will make scissor fobs out of them. 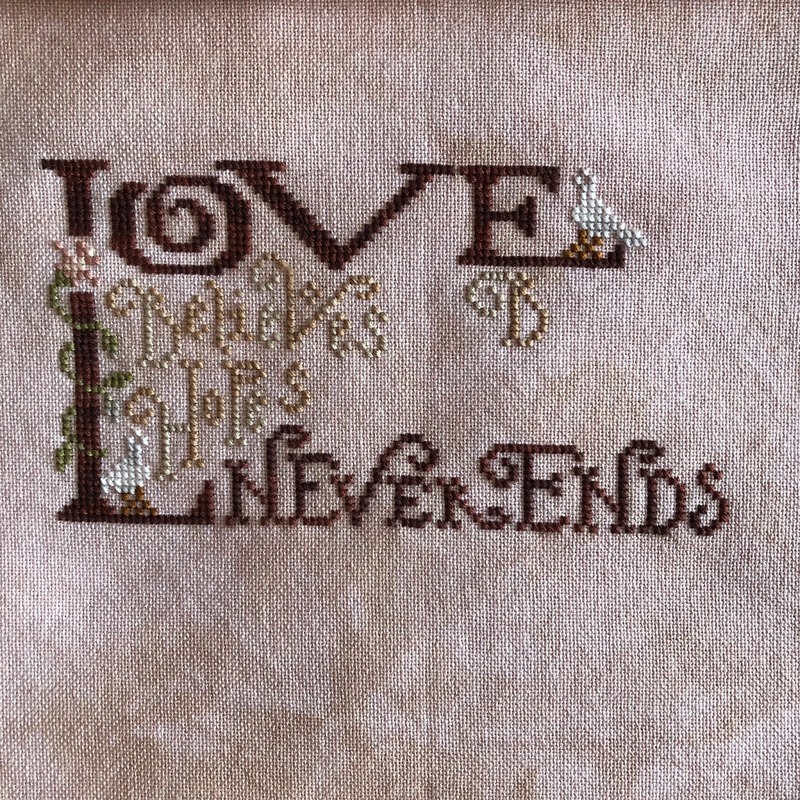 This is a wedding sampler for The Hubs' niece. A couple more words and some filling motifs and the major part of the stitching will be done. There is a band across the bottom with the bride and groom's initials and wedding year to finish it all off. I hope to have the majority of it finished this week. The wedding isn't until next year, so I am well ahead on it!! I also worked on Just Nan's Happy Bluebird while there and finished it at my parent's. 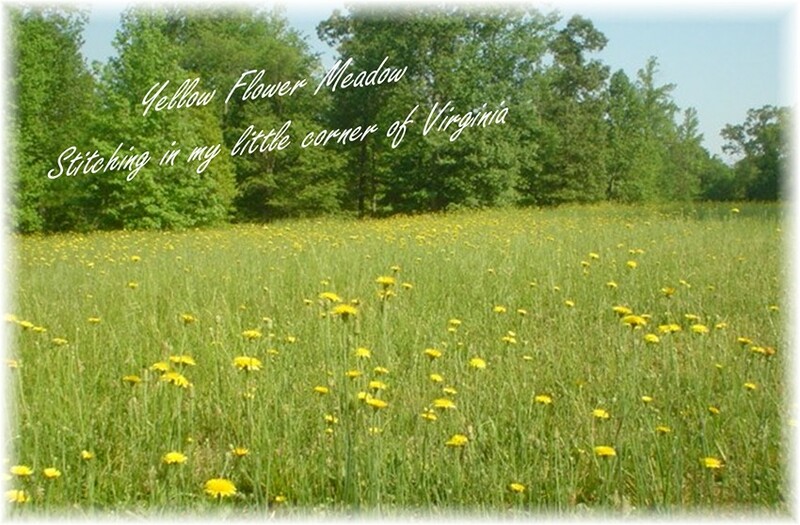 This is where the part of my title comes into play. The Smalls SAL is hosted by Heather at Stitching Lotus and is a reminder that bigger isn't always better. 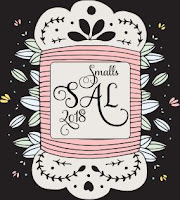 I had great hopes of finishing my The Sampler Life SAL this year with this SAL, but so far I have found other smalls that are more interesting. And looking at the photo, I just realized that I missed an eyelet, so a 99.99% finish. I'll be stitching an eyelet tonight for a 100% finish. 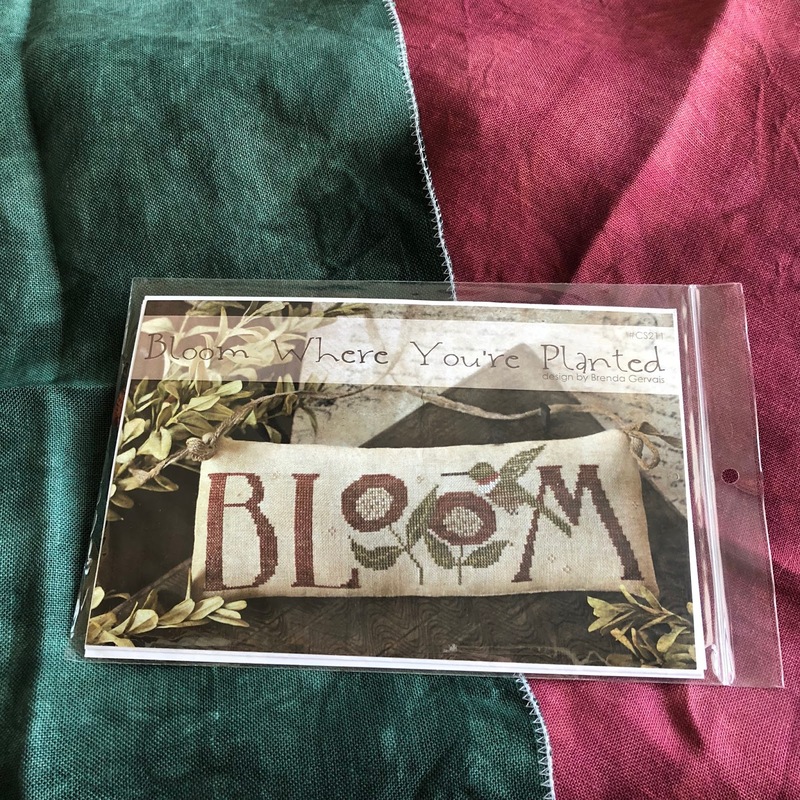 The pattern is "Bloom Where You're Planted" from With Thy Needle and Thread. There's a thread inside the package the pattern does not come with the thread I just store them all together, so the photo is actually of four things. The fabrics are from Hand Dyed Fabric by Stephanie. Stephanie herself was there and honestly we looked a bit like a swarm of locust descending on her when she came in. The fabric on the left is 32-count Balsam Fir and the one on the right is 28-count Autumn Splendor. In addition to the pictured items, I ordered a piece of 32-count Glastonbury Tor for Mirabilia's Shakespeare's Fairies after hemming and hawing over colors - thank you to everyone that helped with the decision making. I also picked up Crab from the Mill Hill Buttons and Beads collection and the GAST for Ingleside Imaginarium's Guardians of Notre Dame. I am happy to report that I stayed within my budget, but I could have blown it wide open with the fabrics. The whole "colors are different on your monitor" thing? TRUE!! I never would have picked Glastonbury Tor if I hadn't seen it in person. Last but definitely not least is . 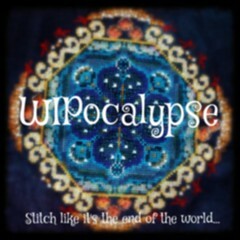 WIPocalypse is hosted by Melissa at Measi's Musings and is a gentle nudge to finish some of those pieces that may not have been getting the love they deserve. Melissa gives us blogging topics each month - this month's is: What newer designers and product creators (fabric or floss dyeing, etc) out there have you discovered and recommend? I am always the last to find out about something new, so if I mention it as new it's most likely many months or years old. So with that caveat, for me, Stephanie's fabrics from above are definitely my newest "oh my, where have you been all my stitching life" product. Susan, it sounded like you had a fabulous retreat with the class from Beth, the purchases made and the unlimited stitching. Lovely fabrics you picked up and I totally agree with you about the whole colors are different on your monitor thing! Goldie looks super as does Zen. Your pendant is just lovely - your other stitching choices are lovely too. Enjoy your Easter weekend. I took a class with Beth last year. Lovely lady. Glad you had a good time at the retreat. Love the Hand Dyed by Stephanie. Her fabric is beautiful. What a great retreat! Your small is very sweet. Your retreat sounds like it was a lot of fun - and very productive as well! You did really well staying withing budget amidst all the temptation. Sounds like retreat was a blast! Your WIPs are looking so good and I just love that wedding sampler that you're doing; it's super sweet. Gifted Gorgeousness and it's IHSW!